This deliciously sweet-scented "buttonhole" rose has been winning the hearts of gardeners everywhere since 1894. 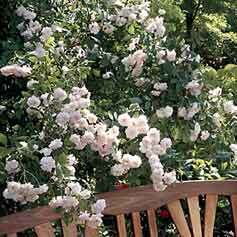 Our robust, antique climber evokes the romance of a bygone era with sprays of petite, fragrant sweetheart roses. Flexible canes and a casual, rambling habit make it an ideal match for stylish garden structures. Simply enchanting with perennials in an informal garden. 8'-10' high (or a lot higher), with soft pink , long, pointed buds. Blooms are 1"-2", with 30 petals. Dark green foliagewith a tea rose fragrance. Really a once-a-year bloomer, but well worth it!